We’d love your help. Let us know what’s wrong with this preview of Katelyn's Choice by Susan G. Mathis. Katelyn Kavanagh’s mother dreamed her daughter would one day escape the oppressive environment of their Upstate New York farm for service in the enchanting Thousand Islands, home to Gilded Age millionaires. But when her wish comes true, Katelyn finds herself in the service of none other t The Gilded Age comes to life in this first installment of the Thousand Islands Series! To ask other readers questions about Katelyn's Choice, please sign up. What was your favorite scene in Katelyn's Choice? A very enjoyable and astounding story. I knew nothing of these islands let alone the history of them. A very engaging story about Pullman Island, originally called Sweet Island before the Pullman's purchased it in 1849. The great occasion that is told is true, but not the story about those that actually worked for the Pullman family. The story pulls you in and I stayed up to the wee hours to finish the book. Katelyn has a problem keeping confidence with which she has always battled. This story d A very enjoyable and astounding story. I knew nothing of these islands let alone the history of them. A very engaging story about Pullman Island, originally called Sweet Island before the Pullman's purchased it in 1849. The great occasion that is told is true, but not the story about those that actually worked for the Pullman family. The story pulls you in and I stayed up to the wee hours to finish the book. Katelyn has a problem keeping confidence with which she has always battled. This story delves into asking the Lord for guidance, praying then believing it can happen, letting go and letting God - what can happen if we allow that to happen. The book is not overtly religious or preachy, but just subtlety praying and faith by some of the characters. A very good book that I would definitely recommend to any reader. I did receive an ARC copy of this book. This is my voluntary and honest review with my own personal thoughts and opinions. Author Susan Mathis allows us to travel back to 1872 and see the world through the eyes of a young woman in service. I could sympathize with Katelyn and her difficulty keeping her tongue in check. It can be so challenging sometimes. Mathis shows us how to do that by use of prayer and scripture. While not in the least preachy, we see that God wants to walk with us and help us in our times of need. And Katelyn isn’t the only one with some challenges. Very well-developed characters who grow personal Author Susan Mathis allows us to travel back to 1872 and see the world through the eyes of a young woman in service. I could sympathize with Katelyn and her difficulty keeping her tongue in check. It can be so challenging sometimes. Mathis shows us how to do that by use of prayer and scripture. While not in the least preachy, we see that God wants to walk with us and help us in our times of need. And Katelyn isn’t the only one with some challenges. Very well-developed characters who grow personally and spiritually make this story come to life. The author’s research of the time frame and area of the country enhanced the story greatly. I enjoyed learning about the Thousand Islands, and imagining what it would have been like to have the president visit for a few days. If you enjoy clean historical fiction with sweet romance, and a story that has a satisfying ending, then you’ll enjoy Katelyn’s Choice. Katelyn Kavanagh is struggling to accept the death of her mother. Her father and brothers have always treat her poorly. She needs to get away. Fortunately she has a chance to improve her prospects. She and her Irish twin have been offered employment by George M. Pullman at his summer residence. When she goes to this estate on one of the Thousand Islands she enters a world where she struggles with the class distinction between the wealthy and their servants. Will she find herself and be able to t Katelyn Kavanagh is struggling to accept the death of her mother. Her father and brothers have always treat her poorly. She needs to get away. Fortunately she has a chance to improve her prospects. She and her Irish twin have been offered employment by George M. Pullman at his summer residence. When she goes to this estate on one of the Thousand Islands she enters a world where she struggles with the class distinction between the wealthy and their servants. Will she find herself and be able to tame her loose tongue? I enjoyed Katelyn’s inspirational story as she matures and finds love. I especially loved the interaction between Katelyn and the Pullman girls. The book is filled with interesting historical facts on the Gilded Age and the wealthy who summered there. Katelyn is drawn to a childhood acquaintance, Thomas, who works on the Island. The interaction between the characters isn’t always easy. Their emotions get in the way. The dialogue is realistic and honest. I enjoyed Katelyn’s Choice. It is well written. Susan G. Mathis does a wonderful job. She’s able to combine fact and fiction into a riveting story. I’m looking forward to the next book in the Thousand Island Gilded Age Series. "Let me welcome you to Pullman Island, home of the famous George M. Pullman of the Pullman railroad car fame!" "Beyond the boundaries of the small island, out on the St. Lawrence, boats passed on either side, and in the distance, a huge cargo ship made its way along the main shipping channel between the mainland and the island." "I have invited President Ulysses S. Grant to be our guest and enjoy respite here from his re-election campaign." "It is your day to celebrate God’s grand creation here on the mighty St. Lawrence River and in the majestic Thousand Islands." Sign up for my newsletter to stay up-to-date with the latest at www.SusanGMathis.com. “Katelyn’s Choice” is a wonderfully written book. I enjoyed it from beginning to end and so want to know more about Katelyn’s future. Katelyn’s mother has recently died, she is left living on the farm with her father and brothers who are not very nice people; her mother told her to escape the farm and go and see the “enchanted Thousand Islands. Katelyn is lucky enough to be offered a summer job on the Island as a servant to the very famous and rich Pullman family. Katelyn works hard as part of t “Katelyn’s Choice” is a wonderfully written book. I enjoyed it from beginning to end and so want to know more about Katelyn’s future. Katelyn’s mother has recently died, she is left living on the farm with her father and brothers who are not very nice people; her mother told her to escape the farm and go and see the “enchanted Thousand Islands. Katelyn is lucky enough to be offered a summer job on the Island as a servant to the very famous and rich Pullman family. Katelyn works hard as part of the kitchen staff, gets promoted to the serving staff and is sometimes nanny to the two Pullman little girls. Thomas is also working there along with his sister, Katelyn’s best friend. It does not take long for Katelyn and Thomas to have sparks fly between them in both good and bad ways. There is much work to be done on Pullman Island as President Ulysses S. Grant is coming for a visit and this requires much preparation and excitement. Katelyn finds herself in several awkward situations but always manages to pull herself out successfully. This is a very well written book that holds your attention all the way to the end. I loved the element of faith in this book. If you enjoy clean historical fiction you will love this book. This is a new to me author and I look forward to reading the rest of this series. I received an ARC copy of this book. This is my honest opinion. Enjoyed reading this book! The girl has to watch her tongue and not gossip. Her boyfriend has problems too. I recommend this book to anyone who likes romance! Author Susan Mathis sweeps readers away to the fabled Thousand Islands of the St. Lawrence River where class distinctions cut as deeply between the wealthy and their servants as the great river’s channel between the mainland and the jeweled summer playgrounds of America’s Gilded Age. When Katelyn Kavanaugh finds herself employed by the famous George Pullman on Pullman Island, she also discovers that her gossiping tongue can cause unimaginable trouble and possibly cost her the man she loves. Loved this book. I live in New York, but have never been to the Thousand Islands. The story was entertaining and very informative. Katelyn is a great character, but must learn to curb her voice. With the help if Thomas and her superiors, she will ask for God's help and learn to love and call the island her home. Susan G Mathis, author of a thousand stories, is a multi-published author of stories set in the beautiful Thousand Islands, her childhood stomping ground in upstate NY. 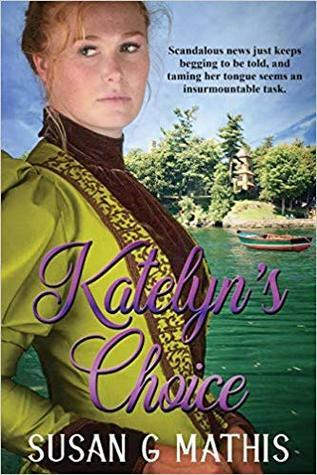 Katelyn’s Choice, the first in The Thousand Islands Gilded Age series, released in March 2019. Book two comes out next March, and she's now writing book three. The Fabric of Hope: An Irish Family Legacy and her Christmas Charity no Susan G Mathis, author of a thousand stories, is a multi-published author of stories set in the beautiful Thousand Islands, her childhood stomping ground in upstate NY. Katelyn’s Choice, the first in The Thousand Islands Gilded Age series, released in March 2019. Book two comes out next March, and she's now writing book three. The Fabric of Hope: An Irish Family Legacy and her Christmas Charity novella are available now. Susan is also a published author of two premarital books with her husband, Dale, two children's picture books, seven stories in a dozen compilation books, and hundreds of published articles. Before Susan jumped into the fiction world, she served as the Founding Editor of Thriving Family magazine and the former Editor/Editorial Director of 12 Focus on the Family publications. Her first two published books were nonfiction, co-authored with her husband, Dale. Countdown for Couples: Preparing for the Adventure of Marriage with an Indonesian and Spanish version, and The ReMarriage Adventure: Preparing for a Life of Love and Happiness, have helped thousands of couples prepare for marriage. Susan is also the author of two picture books, Lexie’s Adventure in Kenya and Princess Madison’s Rainbow Adventure. Moreover, she is published in various book compilations including five Chicken Soup for the Soul books, Ready to Wed, Supporting Families Through Meaningful Ministry, The Christian Leadership Experience, and Spiritual Mentoring of Teens. Susan has also written hundreds of magazine and newsletter articles.